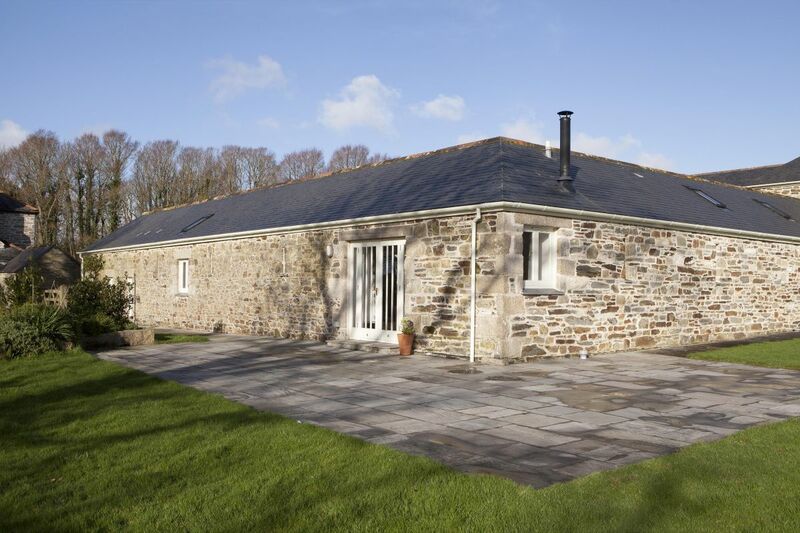 This spacious and comfortable stone-fronted, converted barn is perfect for a family or group of friends. The tranquil countryside setting and wide-open lawns with fields either side attracts local wildlife. With its proximity to Porthleven, it offers the best of both country and seaside! Meadow Barn has wheelchair access. 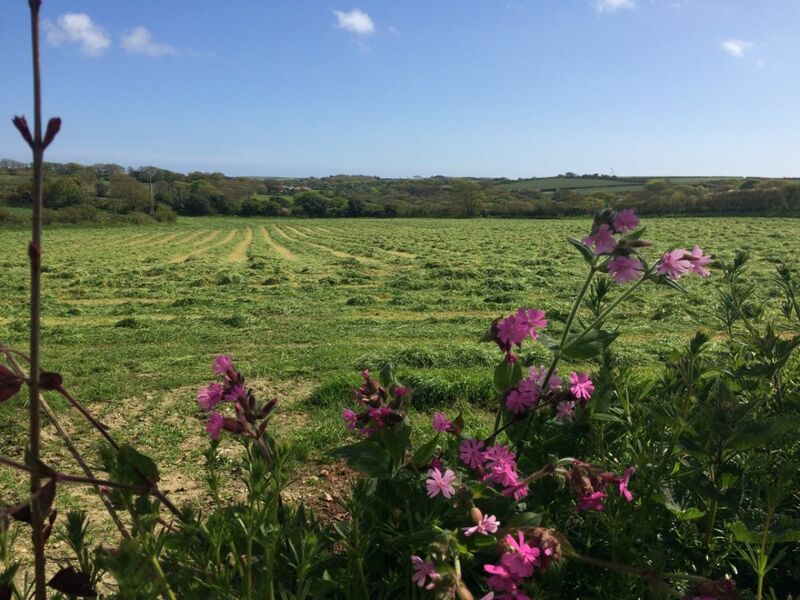 Access to Meadow Barn is by a country lane leading to the outskirts of Porthleven. 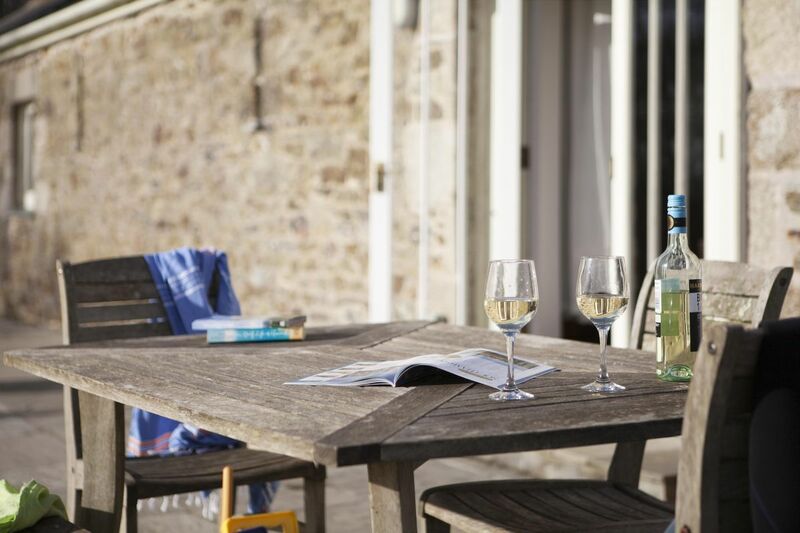 Guests immediately feel relaxed as they arrive in the rural courtyard enclosed by the converted barn and the neighbouring farmhouse. 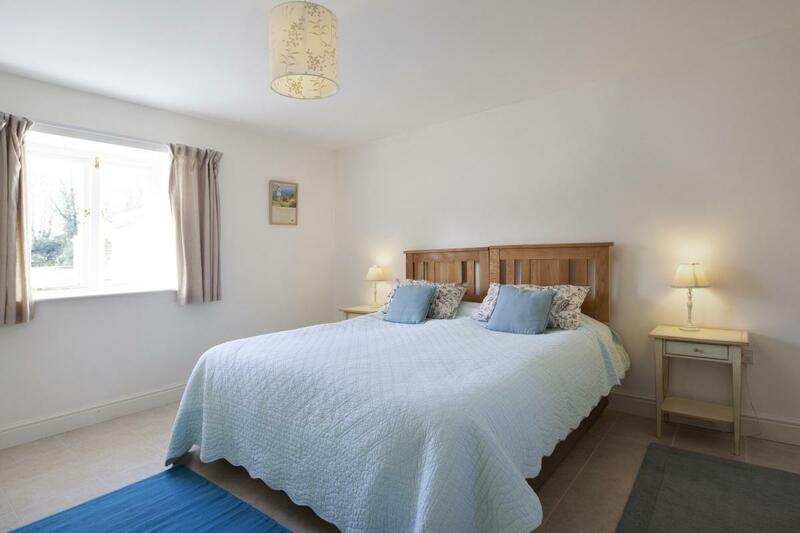 Four large bedrooms comfortably sleep 6 guests in a superking, double and two single rooms. A cot is also available. 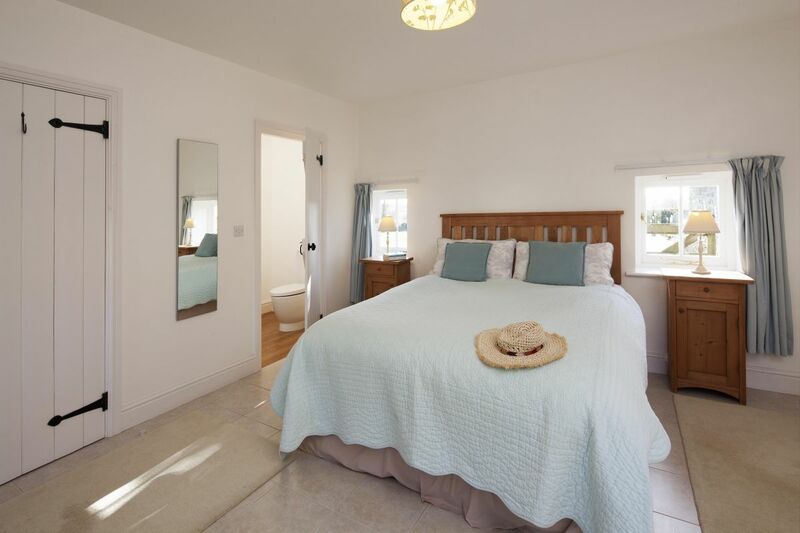 The master bedroom has an ensuite and there is also a large family bathroom. 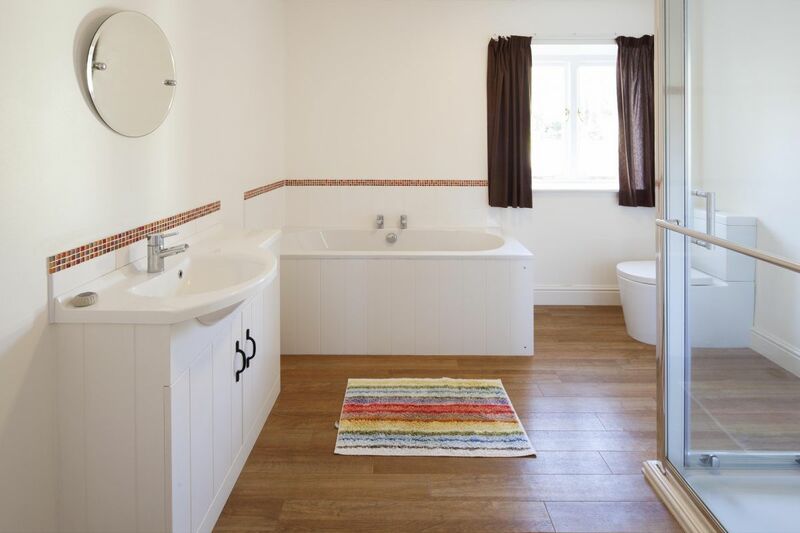 The layout makes it perfect for multigenerational groups where grandparents may prefer the room with the ensuite which is at ground level, beyond the kitchen, whilst the younger generations share the ‘wing’ with the larger bathroom. The living area is a large, bright, elongated room facing onto the garden. The living room with woodburner occupies one side of the room, the country style dining table in the middle and the large kitchen to the other side. 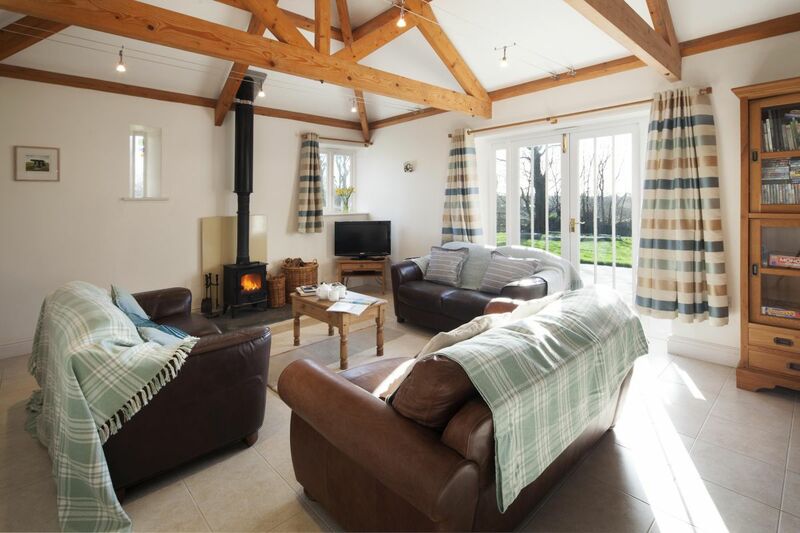 Beneath the lovely wood beam vaulted ceiling, there is plenty of space for everyone. Beyond the kitchen is a good size utility room with washing machine, tumble dryer and iron. 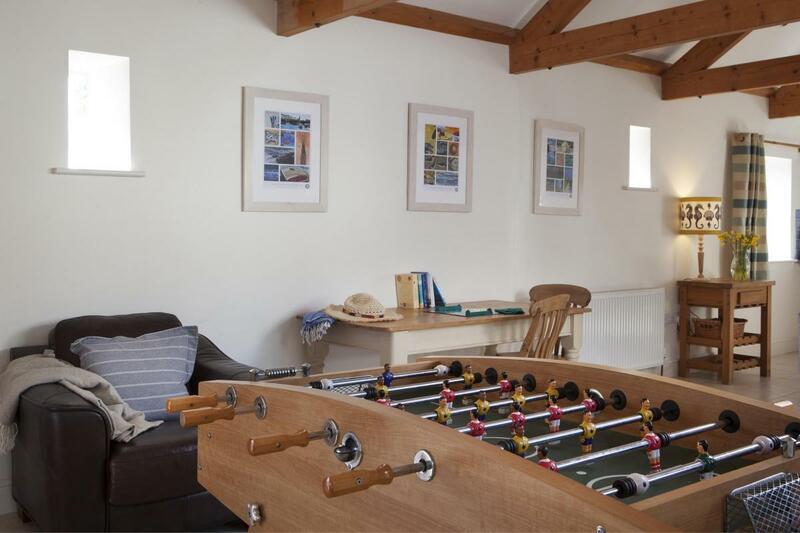 Guests are free to enjoy the well- stocked library of games, DVDs, books and maps and the very popular football table! 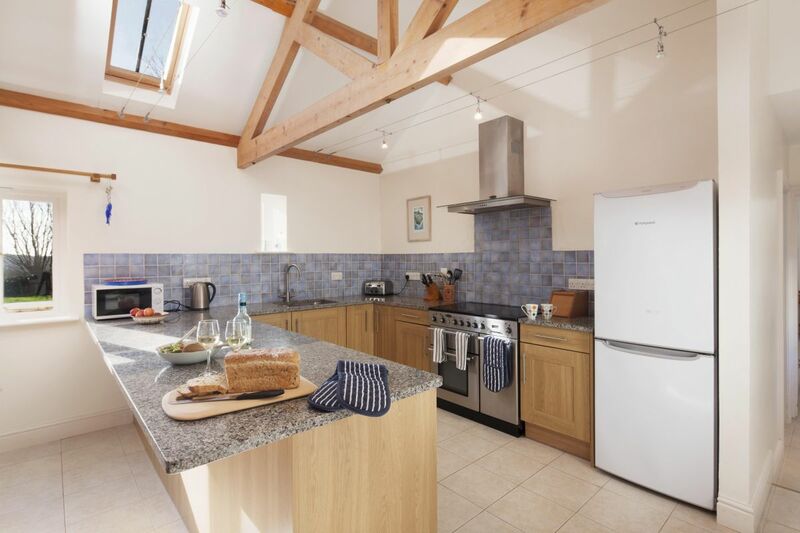 The large, open kitchen has a breakfast bar and stools and is big enough to make a family feast for those who love to cook. 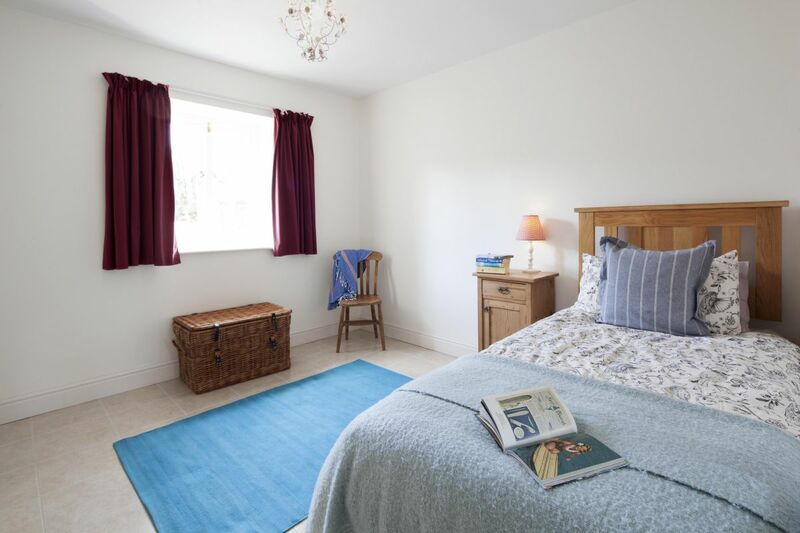 There is an abundance of cupboard space and everything a guest may need. 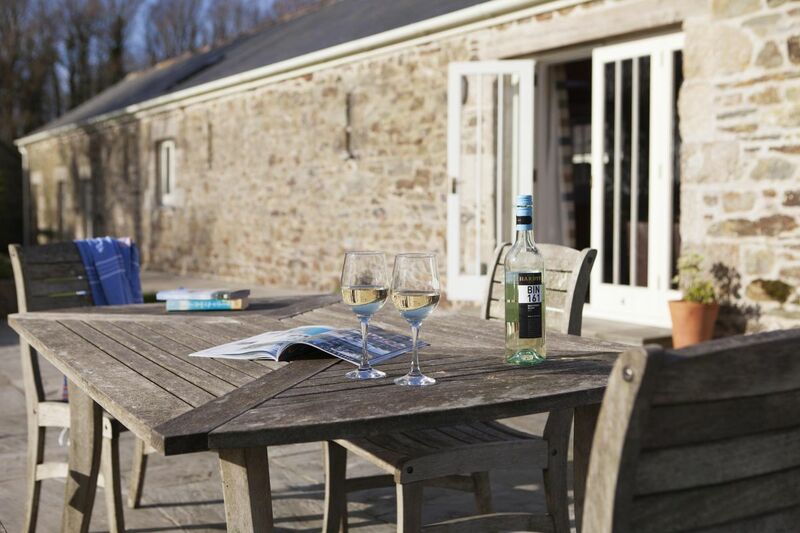 French doors open to the large patio and garden – a lovely space in which to relax with garden furniture and a BBQ for true alfresco dining. The fire pit in the middle of the garden is wonderful for sitting around, roasting marshmallows and watching for shooting stars at night. 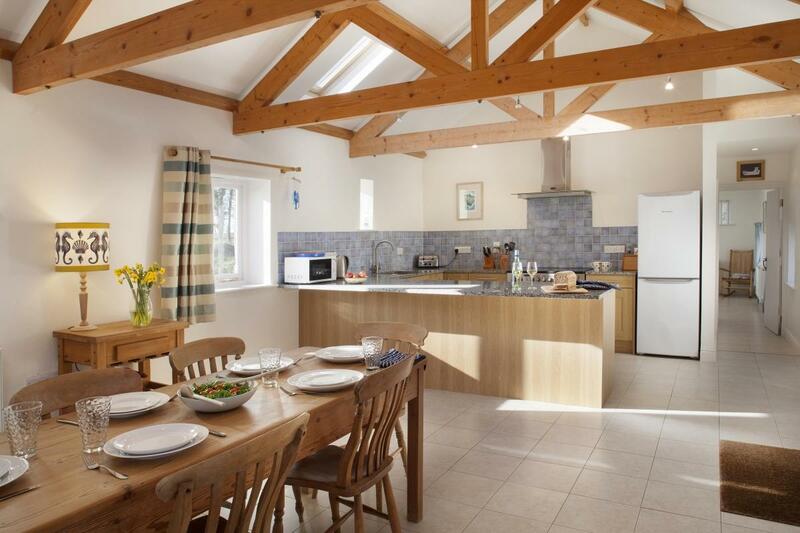 Meadow Barn is where family memories are made! 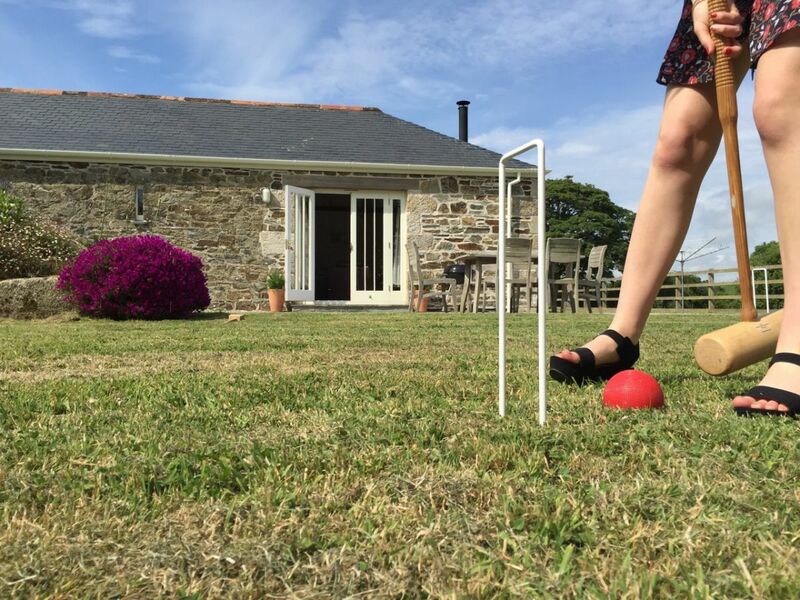 After a day exploring beaches and sights, more energetic visitors can continue fun and games with a friendly round of croquet on the large lawn. 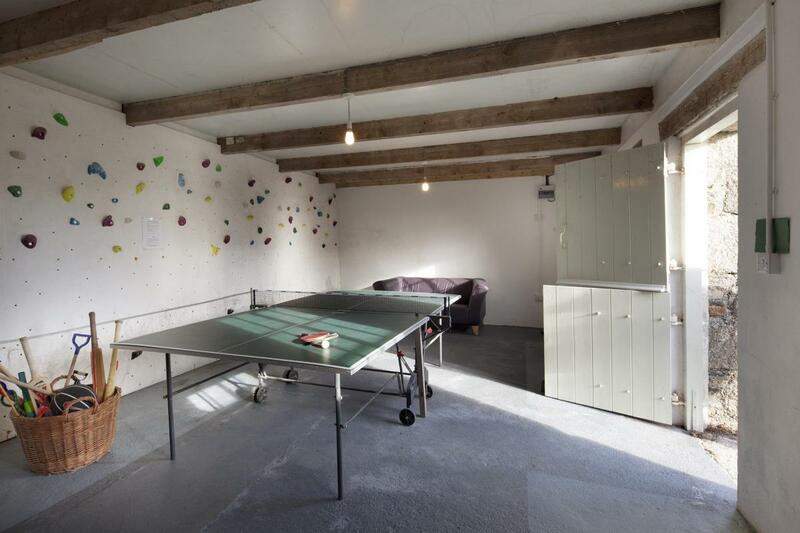 Guests enjoy a separate games room which is equipped with a table tennis table, climbing wall and rowing machine and will find plenty of spare buckets, spades and beach balls. 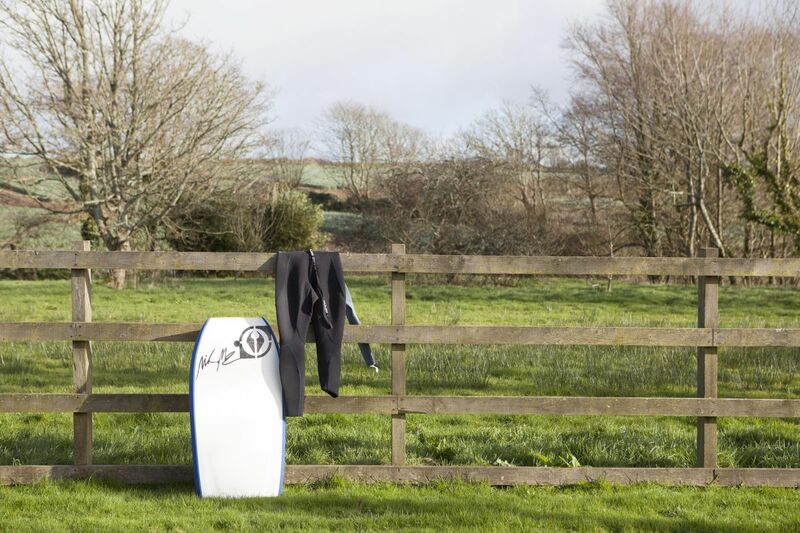 A hosepipe is provided to wash down boards and wetsuits before hanging them safely on Meadow Barn’s fence to dry. There is also separate bike storage. Other than two shallow steps into Meadow Barn and a shallow step in the property, floors are level. The outside patio is accessible for wheelchair users. If you are coming with a wheelchair, please call us to be reassured. We are happy to send dimensions so that you can be sure the property suits your needs. We have had wheelchair users holiday very successfully at Meadow Barn. 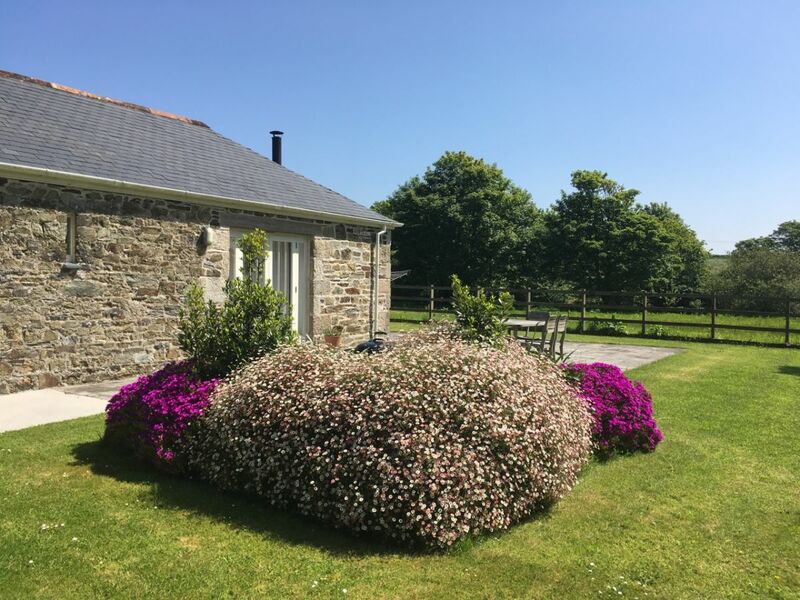 Meadow Barn is just a few minutes from Porthleven with its sandy beach and within easy reach of other beautiful beaches on both the north and south coast. Porthleven has a number of local pubs, award-winning restaurants and cafes from which to choose. It is close to many popular attractions of Cornwall including St Michael’s Mount, the Minack Theatre and Tate St Ives. 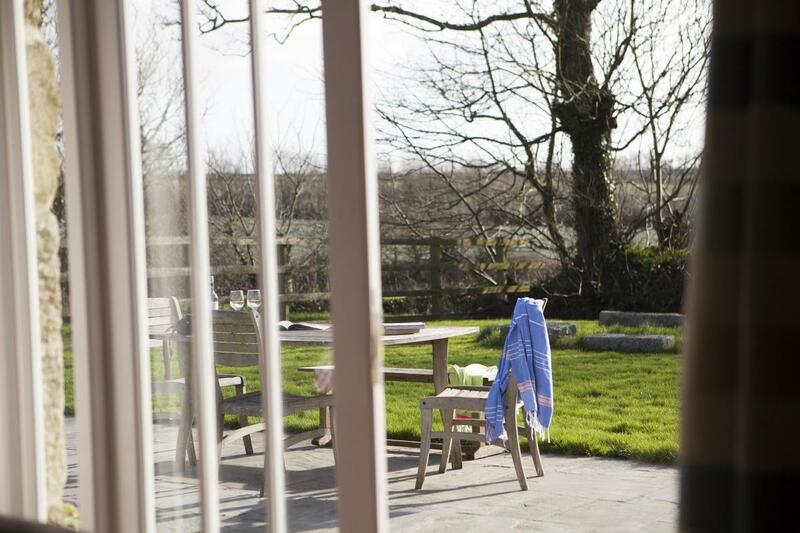 Guests often prefer to stay local – tempted to stroll the local countryside accessed from walks right outside the door. There is no wifi in this property because of its rural location. There is good 4G signal and we would advise you buy extra data bundles if you think you will need it or download before you arrive. The property is cared for by Jane and Antony who live in the old farmhouse next door. They like to greet guests on arrival and are on hand to suggest special places to visit whilst on your holiday that you may not find in the guidebooks. They love walking the coastal path, kayaking from dozens of sandy and rocky beaches and enjoying their Cornish life. The garden is not fully secured for dogs off the lead and the friendly farm dog may occasionally wander in so we ask you to kindly be responsible for your pet at all times. No wifi. Good 4G coverage. Fantastic accommodation in a wonderful setting and your company could not have been more helpful. We loved our stay here. Walking to the village was very do-able if you don't mind the hill back! And we were very central for surrounding villages. Loved the scones and cream as a welcome treat, and Jane it was so lovely to meet you and your hubby. We could not have asked for a more helpful host. Enjoyed the peaceful garden, great showers, warm interior, ample kitchen and even laundry. We visited in February half term and had a fantastic time playing table tennis and watching well chosen selections of films in front of the log burner. A very comfortable house. When the sun came out we enjoyed taking walks and eating ice cream in Porthleven, which has lovely restaurants, a beach and great surf. Jane and Antony are very friendly and offer great suggestions for things to do locally. An awesome place to have a holiday! We look forward to staying again. We had a great week, the barn is in a beautiful setting and extremely well equipped and easily accommodated our two families. The furnishings are to a hight standard, the kitchen well equipped, with everything thought of. 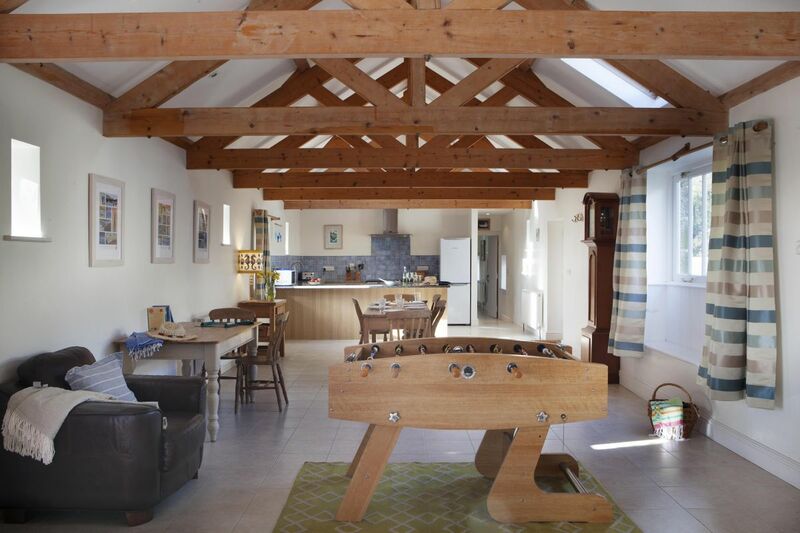 The Barn has plenty of outside space for the children to play and a lovely patio area inclusive of a fire pit which our husbands enjoyed, as did the children toasting marshmallows. The play barn entertained both little and big kids (adults!) as did the table football in the lounge. 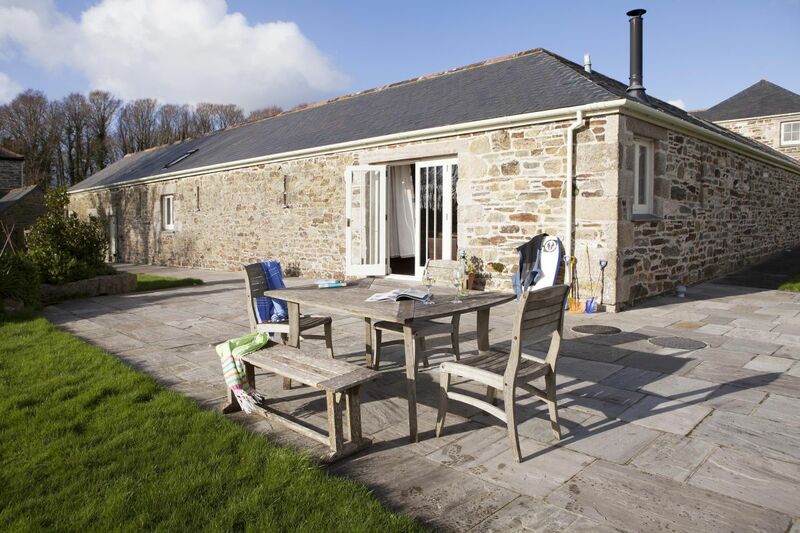 The Barn is in a lovely location with easy access to some beautiful beaches, Perranuthnoe in particular. We returned for our second week at Meadow Barn in May. Its a wonderful cottage, loads of space, clean with good facilities. The kids love the football table and outdoor play barn, plus Bilbo the dog. Lots of outdoor space and the owners make you feel really welcome. There is loads to do in the area, even after two weeks we still have more places to go. We stayed for a week in July with friends and had a great time. The barn is huge. We loved the light and airy open living space, the rest of the rooms are a good size and I particularly appreciated the super king size bed. Really well equipped as well, the BBQ and outside table was well used, a good choice of DVDs and books and the table football is a nice touch. The garden is really great for kids and feels private and peaceful, the owners helpful and friendly. 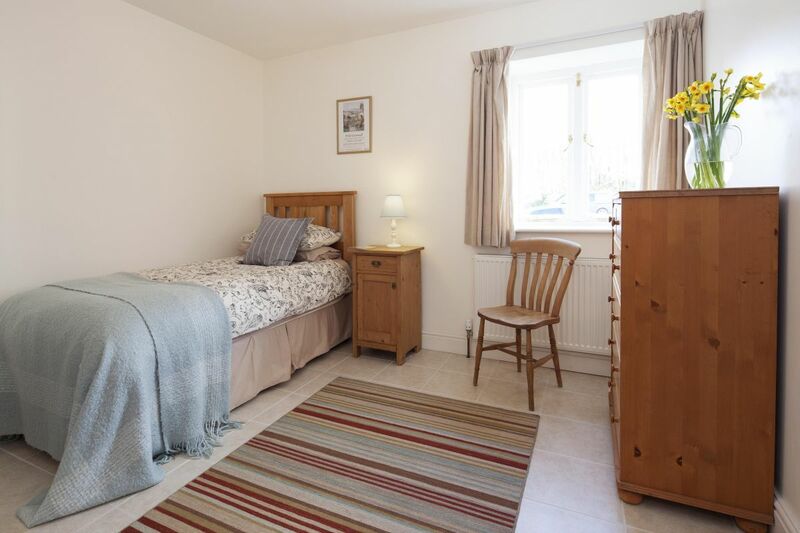 Really well situated in a beautiful area with the charm of Porthleven and the facilities of Helston a short drive away. Perfect base for our holiday.